Cathedral of St Peter is a church in Worms, southern Germany. 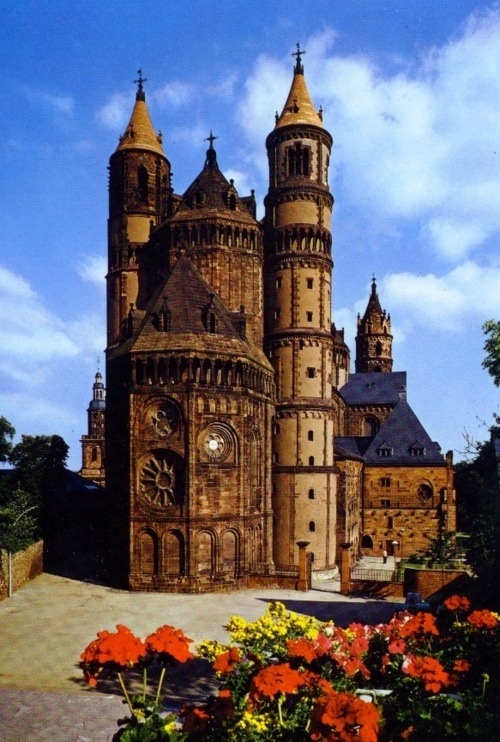 It was the seat of the Catholic Prince-Bishopric of Worms until its extinction in 1800. It is a basilica with four round towers, two large domes, and a choir at each end. The interior is built in red sandstone. Only the ground plan and the lower part of the western towers belong to the original building consecrated in 1110. The remainder was mostly finished by 1181, but the west choir and the vaulting were built in the 13th century, the elaborate south portal was added in the 14th century, and the central dome has been rebuilt. The ornamentation of the older parts is simple; even the more elaborate later forms show no high development of workmanship. Unique sculptures depicting salvation stories appear above the Gothic-era south doorway. The baptismal font contains five remarkable stone reliefs from the late 15th century. The church's original windows were destroyed by bombing in 1943; between 1965 to 1995 new windows were made by Mainz artist Alois Plum.